A horror/fantasy/mystery series of novels, fifteen and counting plus associated short stories and comic miniseries and the like, by Jim Butcher. Harry Dresden is a wizard and private detective operating out of modern day Chicago, and reluctantly hired by a special police task force as a consultant on supernatural crimes. A cross between urban gothic fantasy and Film Noir, the Genre Savvy main character cracks jokes about the various tropes it uses. Adapted into a drama series on the Sci Fi Channel. There's also a tabletop RPG, which is much more faithful to the books, as it's written from the characters' perspective. Harry meets a wide variety of characters in the series, including Karrin Murphy, the Action Girl cop who's aware of the city's supernatural underworld; Bob, a spirit of intellect who lives in a skull -- human-shaped ghost in the television series -- is Harry's literal Magical Computer; Michael Carpenter, a modern-day paladin wielding a holy sword; Billy the Werewolf and his pack of Alphas (a group of young heroic wannabes); Thomas Raith, the Loveable Rogue incubus White Court vampire; Harry's on-and-off love interest Susan Rodriguez; and Molly Carpenter, Michael's oldest daughter and Harry's |apprentice. Like many detective stories, Harry meets a ridiculous number of femmes fatale, crime bosses, and hired goons, which is frequently lampshaded in the series. Novels 1 - 9 have been collected in 4 different omnibus editions, Wizard for Hire, Wizard by Trade, Wizard at Large and Wizard Under Fire. All of the shorter material except for "AAAA Wizardry," "Even Hand," and "Curses" has been collected in an anthology called Side Jobs released October, 2010. As for the other three, Butcher has promised that all of the shorts would be available in collected form, so as he put it, he'll just have to write enough short stories to get another anthology. Welcome to the Jungle: A prequel to the series. Storm Front: An adaptation of the first novel. Fool Moon: An adaptation of the second novel. Word of God says that the series will have at least twenty books, which will then be capped off by an apocalyptic trilogy. Because, to quote the author, "Who doesn't love apocalyptic trilogies?" A single season TV adaptation was produced in 2007 and can be viewed here; tropes specific to it go on its own page. In addition to the page links at the top, there is also a shout out page. The recap page is under major construction, so help with it would be appreciated. 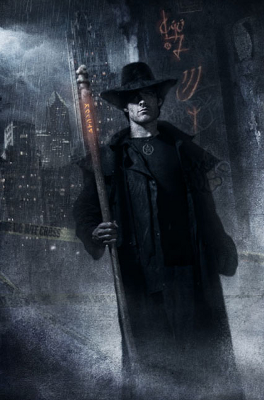 The following tropes are common to many or all entries in the The Dresden Files franchise. This page was last edited on 4 February 2019, at 15:38.